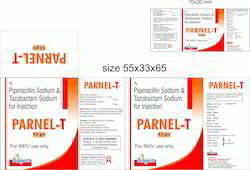 Prominent & Leading Manufacturer from Jaipur, we offer tazobactam and piperacilin. With thorough industry knowledge, we are engaged in manufacturing, supplying, trading, distributing, wholesaling and exporting a wide range of Tazobactam And Piperacilin. These are antibacterial combination products consisting of the semisynthetic antibacterial piperacillin sodium and the β-lactamase inhibitor tazobactam sodium for intravenous administration. These are offered in different quantity packs.